Pain or discomfort in the upper abdomen. This is the area below the rib cage and above the belly button. 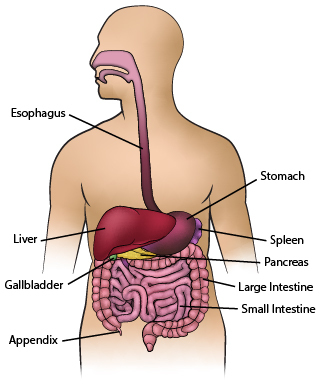 There are many things that can cause pain in the upper part of the stomach (abdomen). Most causes are not serious. Pain in this area can be caused by eating too much. It can be caused by a food or a drug that upsets the stomach. It can be caused by more serious problems like stomach ulcers or a gallbladder attack. Reflux disease (GERD) causes a burning pain that goes into the chest. Laying down makes pain worse. Some people with reflux get a sour or bitter taste in their mouths. Mild stomach pain can be caused by an upset stomach, gas pains, or eating too much. It can also be caused by reflux disease (GERD). Sometimes mild stomach pain is the first sign of a vomiting illness like stomach flu. Avoid alcohol or drinks with caffeine in them. Stop Smoking: Smoking can make heartburn and stomach problems worse. Avoid Aspirin: Avoid aspirin and drugs such as Motrin, Advil, and Aleve. These drugs can bother your stomach. Try taking Tylenol. Antacid: If you are having pain now, try taking a liquid antacid. Follow all instructions on the bottle. Reflux Disease (GERD): Eat smaller meals and avoid snacks for 2 hours before sleeping. Avoid foods that tend to cause heartburn and stomach problems. These include fatty/greasy foods, spicy foods, mints, chocolate, and drinks with caffeine. What to Expect: With harmless causes, the pain most often goes away within 2 hours. With stomach flu, the pain may come and go for 2 to 3 days. You may have belly cramps before you vomit or have diarrhea. If your pain does not stop and gets worse, it may be more serious.